Since 1900, Nicholas Roerich has been working on a conceived series of paintings on the “Slavic” theme. The artist was then in Paris, but still managed to embody the images of the ancient Russian life that inspired him. As a traveler, he visited the excavation site. In the Tsarskoye Selo district mounds were found where, according to legend, there were pagan prayer places – temples. Here, according to tradition, animals were sacrificed. 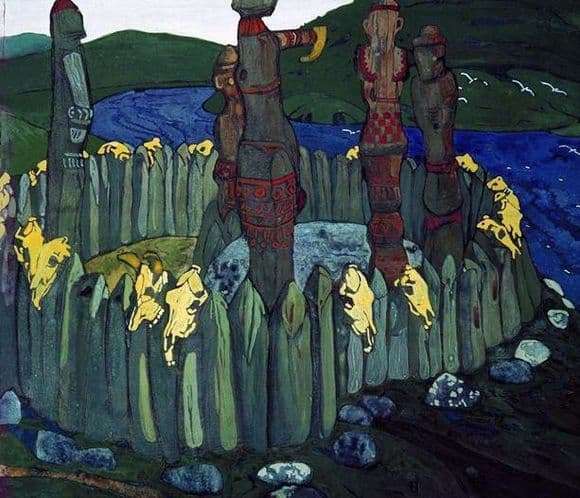 Roerich depicted the images of the pagan religious notions in the painting “Idols” of 1901. On a high steep hill, a Slavic temple was built. The sacred place for prayers and sacrifices is surrounded by natural elements. We see a cliff and a blue river running into the distance. Flocks of gulls peacefully soar above it. In the distance, the hillocks are green with thick grass. The temple includes several idols – statues of pagan deities. In the center of the circle is the figure of the most senior deity, and next to it are smaller statues. All of them are decorated with colorful ethnic ornaments. Here is a large gray stone for sacrifices. Ritual attributes are placed in a circle and enclosed by a palisade. Log tops are hewn into sharp stakes. On them are fixed the skulls of killed animals, after sacrificing them to the gods. Roerich did not depict people in the picture. But he perfectly conveyed the pagan atmosphere, taking into account the objective world. He studied history, personally saw the excavated ancient idols, therefore embodied on canvas can be perceived as really once existing. The painting “Idols” takes us back a century, when the Slavs were closer to nature, worshiped its forces and felt fear of it. The artist created a harmonious composition. Vertical lines of paling and high idols stand out noticeably against the background of natural flowing lines of hills and river flow. In the Russian Museum of St. Petersburg, everyone will be able to admire the legendary “Idols” of Roerich.